Go Shuck An Oyster: Recycling oyster shells, who knew? Recycling oyster shells, who knew? - recycled shells are used to build oyster reefs in protected oyster sanctuaries. Unfortunately I'm not the first blogger to tackle this topic, so to find out more, read the Menu Pages Blog. Next time you Go Shuck An Oyster, be sure to recycle the shells. There are links to the Town's realtime water quality meter and other similar work being initiated by UMass Boston who is monitoring the project. There will be public talks on the Wellfleet Propagation project at Wellfleet Oysterfest Sat Oct 15 and Sun Oct 16 2011 @9AM at Wellfleet Town Pier. Thanks for letting us know, Curt. 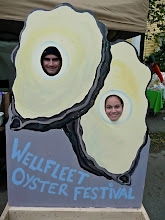 The Wellfleet Oysterfest is one of our favorite events each year.